Are you in the market for new commercial flooring for your business? #1. Will it fit in my budget? First and foremost, you have to be able to afford to install the flooring you select. That means that, before you do anything else, you’ll need to sit down and figure out how much you can spend on your commercial floors. Prices of flooring types can vary drastically, and when you have a price in mind from the beginning, it will help to narrow down your options right away. Plus, getting this step out of the way first will also help you avoid falling in love with something that is outside of your price range. #2. How much foot traffic will it have to endure? Is your business a retail store or a restaurant, where people are constantly filtering in and out? 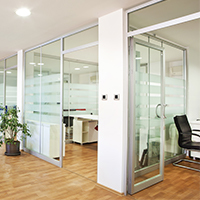 Or is your business a small office, where only a few people will be walking on your commercial floors? The amount of foot traffic you get in your business is definitely something you want to consider in the decision-making process, because not all flooring types can stand up to traffic equally. For businesses with a lot of foot traffic, linoleum, tile or durable carpet could all be great choices. #3. Will it stand up to my business’s unique needs? The industry you are in and the products or services you sell can make all of the difference in the world when choosing flooring types. For example, if you own a bar or a restaurant, wood or luxury carpet floors could easily be destroyed by spills. But, if you own an office building, you could safely install pretty much any flooring you prefer. #4. How much maintenance will it require? Every type of commercial flooring will require some level of maintenance, but there’s no doubt about the fact that some are more high maintenance than others. Maintenance not only takes time and energy, but it’s also an added cost, so make sure to factor in your flooring’s maintenance needs into your budget. Luckily, there are plenty of low-maintenance flooring options available; you just have to know where to look! #5. Does it complement my business’s existing ambiance? Last but certainly not least, the flooring you invest in needs to add to your business’s existing ambiance, not take away from it. 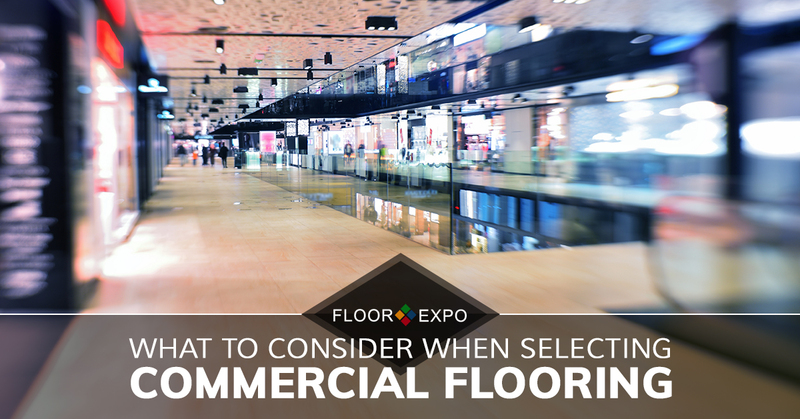 Thinking about the type of business you have will go along way towards selecting the right style of flooring for your business. For example, if you run a preschool or a toy store, your best option might be carpet, tile or linoleum that has a fun pattern or bright colors. If your business is an up-and-coming software company, select something modern, like hardwood flooring. Think about the impression the flooring will make on your clients and customer every time they enter your building, and you’ll have a much easier time making the right choice. Turn to our go-to flooring experts today. 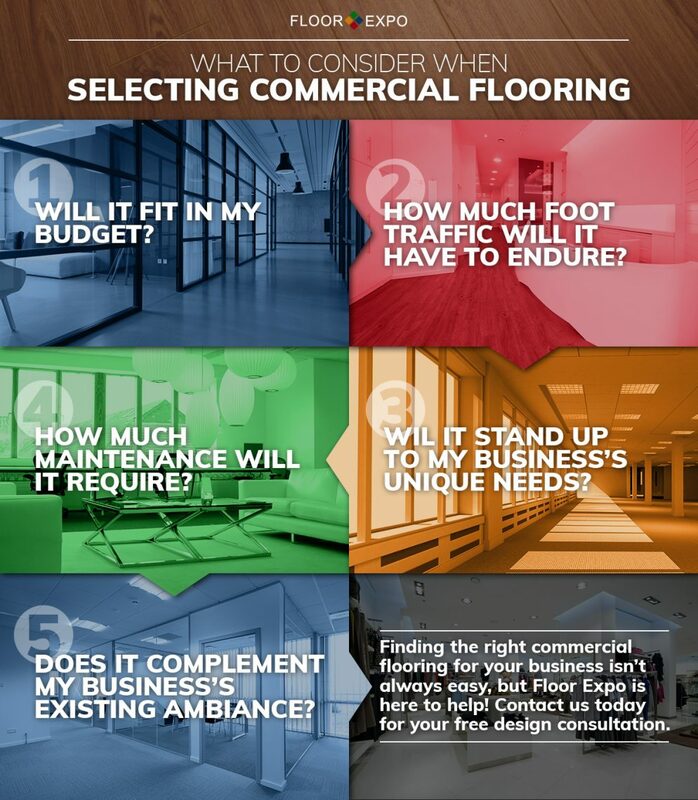 As you can see, there are many things to consider when choosing commercial floors for your business. We hope that this blog has given you a good starting out point, but if you would like some assistance, don’t hesitate to give us a call. We’ve been serving New Jersey and New York with professional flooring solutions for over 30 years, and we have what it takes to provide you with the right option for your needs. Stop by our flooring showroom in Fairfield or contact us today for your free design consultation.